It’s the news you’ve all been waiting for. 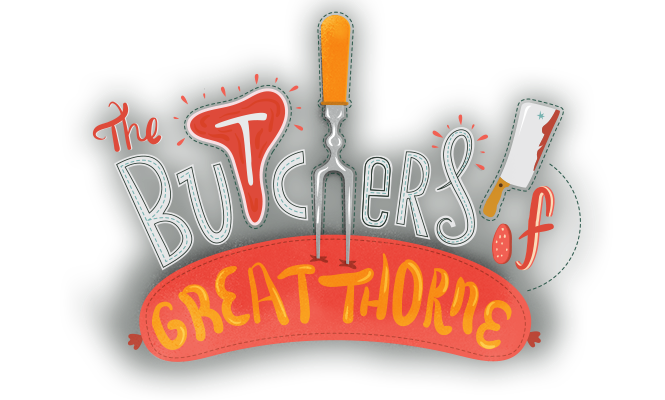 The Butchers of Great Thorne have re-united like freshly linked sausages. 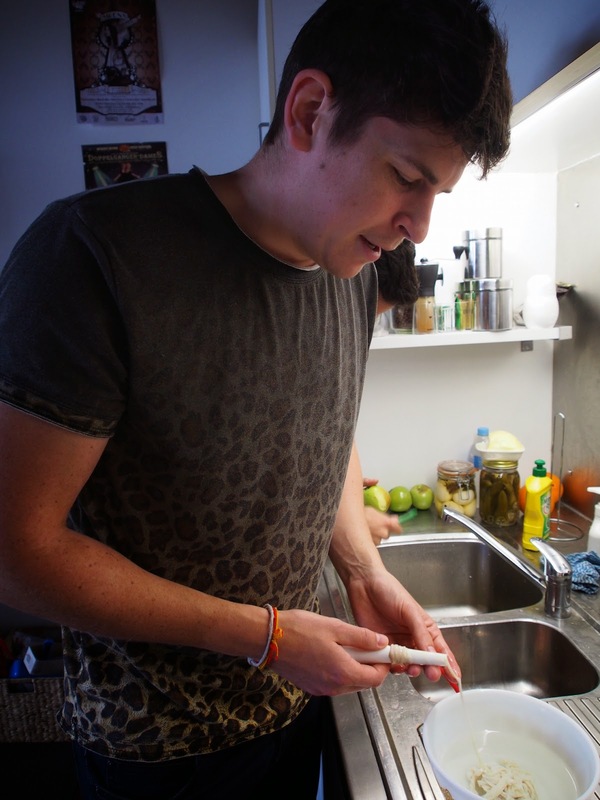 After 18 months away in the UK, the home of modern butchery, Vinnie returned to Australia. We don’t want to mince words - we’re very happy to be back in business and will forget that awful time by engaging in some offal time! As our first butchery project this year, we decided to make Merguez sausages. We recently went to Fatima’s in Surry Hills for a Lebanese feast, and tasted some deliciously spicy Lebanese sausages, which were grilled over charcoal. In an attempt to recreate this, we researched recipes for sausages from the Middle East and Africa and the one that stood out was the Merguez sausage. This is also our first lamb sausage, despite it being cut with a decent amount of pork fat. A key ingredient in the Merguez is Harissa paste, which we made from scratch. The paste included some Mexican Ancho and Guajillo chillies which gives it a really earthy, smoky flavour. Vinnie will post a recipe for Harissa paste on his Jarhead Pickling blog. We have also now invested in a new sausage filler that makes really quick work of the stuffing process compared to the standard filler attachment to a food mixer/processor. Our use of lamb shoulder also gave the sausages a really nice flavour and texture, and even after cooking them through on a barbecue, they still retain a lot of juice. One improvement for next time will be to increase the amount of Harissa, paprika and chilli powder in the mix for additional heat. Best way to serve these Merguez – on flat breads with tabbouleh and some garlicky yoghurt. 2 tablespoons of cumin seeds. ½ Cup of Harissa Paste (find recipe here). 1 tablespoon of ground pepper. 2 tablespoons of fine sea salt. 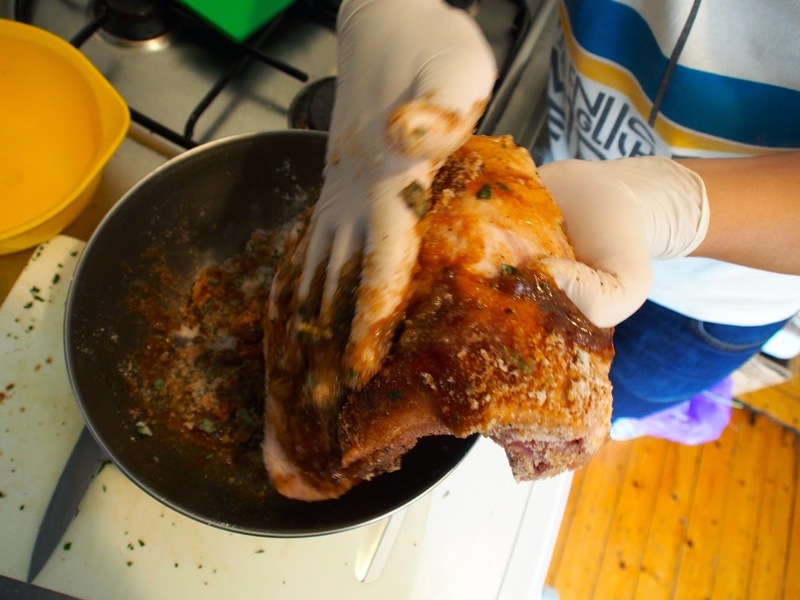 Chop up the lamb shoulder and fat into small pieces and place the chopped meat into the freezer to harden for an hour. Grind the meat and fat on a coarse setting. Meanwhile, toast the fennel and cumin seeds and the pepper in a pan and then grind until the spices become a powder. Mix the ground spices through the meat along with the harissa paste and the salt. Following the success of our first batch of sausages, we decided to get ahead of ourselves and take on a chicken sausage and the legendary Boerewors. Once again we had the help of our friends Alex and Danny (although unfortunately no Orson the dog). This post will be about the Boerewors we made, but we’ll post about the chicken sausages in the coming weeks. The word “Boerewors” is an Afrikaans word which translates to “farmers sausage”. 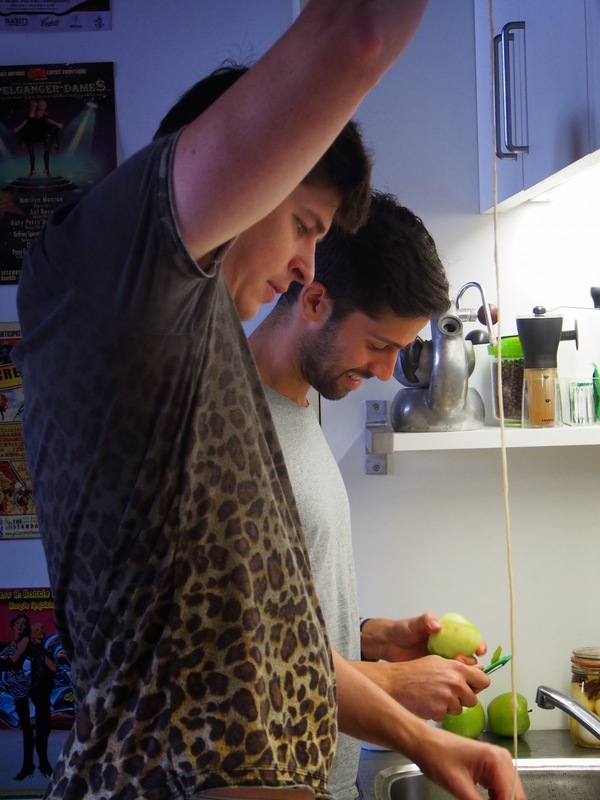 It’s a favourite of David who has South African heritage, and has been eating it since he was a kid. Boerewors must contain 90% meat (i.e. limited random bits and pieces that are not uncommon in commercial sausage production), must contain beef, and usually also includes pork or lamb. The most distinct flavor in the Boerewors comes from the ground cloves. So if you’re not a fan of the flavor of cloves, then this sausage is, unfortunately, not for you! South Africans take Boerewors so seriously that they put in place some legislation with the elaborate title: The Regulations Governing the Composition and Labelling of Raw Boerewors, Raw Species Sausage and Raw Mixed-Species Sausage. The regulations were put in place following a period during the 1960s where cheap Boerewors, which often included inferior ingredients such as offal, bone meal and soy, flooded the market. The legislation requires, amongst other things that "raw Boerewors shall be manufactured from the meat of an animal of the bovine, ovine, porcine or caprine species or from a mixtrue of two or more thereof..."
This pretty much means that there are many variations to Boerewors, with some people using different cuts of meats from every animal known to man (e.g. camel or kudu), although these are not true Boerewors and must instead be sold with the dominant meat as the name. In South Africa, butchers are extremely competitive with their Boerewors recipes, vying with one another for the title of the best Boeries in town. As a result Boerewors recipes are often jealously guarded which made life difficult for us. Despite this hurdle, and with the help of the internet and some ancient South African cook books that David's mum owned, we were able to put together the following Boerewors recipe. We initially were looking for mutton instead of lamb to impart a richer flavour, however, the mutton was very expensive that day and in the end, from a flavour perspective, lamb is a good substitute. Similarly, you could swap the pork for some wild boar or add some venison to make the sausage more gamey. The amount of speck or fat is dependent on the fat levels of the cuts of meat you are using and how juicy you like your sausages, however, the fat levels shouldn’t exceed 30%. We opted for around 400 or 500 grams, although we didn't weigh the fat and mainly relied visually on the distribution of fat through the mince. Many recipes call for speck, however, this can be expensive (our butcher gave us the fat for free) and doens't have a huge impact on the final flavour. 1. The first step is to soak the casings in some tap water. 2. 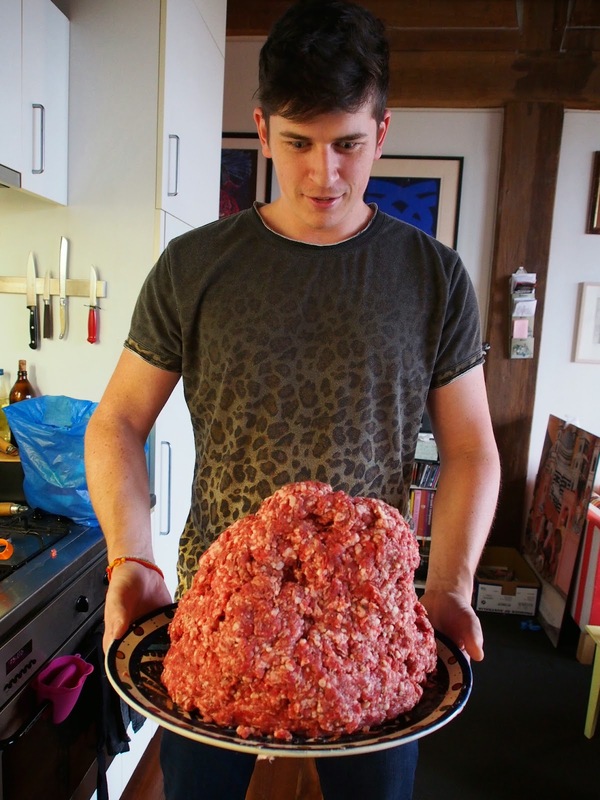 To mince the meat you should pre-freeze the meat in 2 inch cubes for 30 minutes to stiffen it for easier grinding. 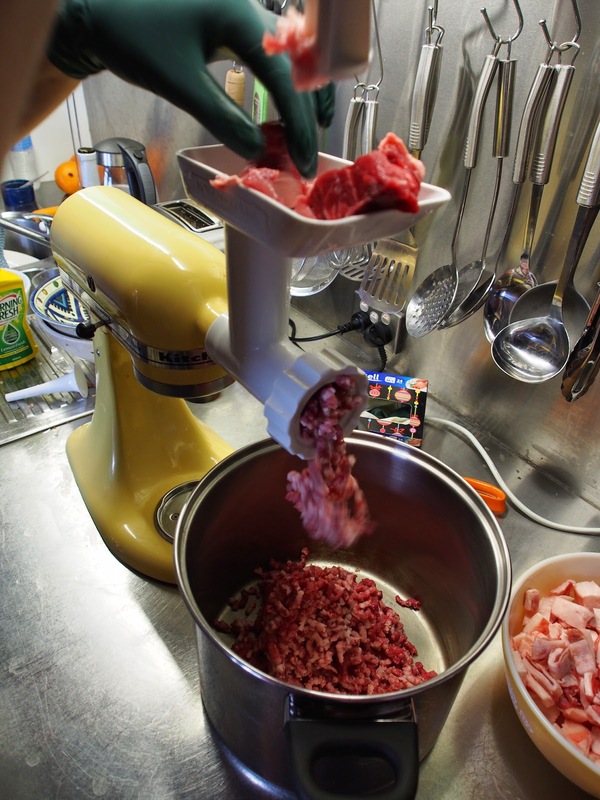 Using a coarse grinding plate, mince the meat and fat. You can use a finer grinding disk if you wish, however, our preferred Boerewors has quite a grainy meat texture so it feels like you are eating real chunks of meat. In this recipe you only grind the meat once (some other sausages require a coarse grinding followed by a second grinding of the mince through a fine grinding plate). 3. Next, roast the coriander seeds and cloves in a dry frying pan, tossing the spices occasionally until uniformly brown and aromatic. Be careful not to burn the spices – best to start on a very low heat and slowly increase if it doesn’t feel like the temperature is sufficient. Grind the coriander and cloves in a pestle and mortar or a spice grinder and sift the ground spices to remove the clove husks (this is an important step as removing the husks from your teeth when you are eating the Boerewors is not an enjoyable task). Mix these spices with the remaining aromatics. When we mixed all of the spices, the aroma of the mixed spices smelt exactly like it should which was very exciting and stomach grumble inducing. 4. After thoroughly combining the spices and vinegar with the mince, the mince will be ready to be stuffed into the casing. Different sized casing can be used, however, we prefer a thick casing around 1 inch in diameter as this leads to a juicy thick sausage. Thinner sausages have a tendency to dry out and juiciness is key to good Boerewors. 5. To fill the casing you push the casing onto a nozzle and tie off the end. Be sure to lubricate the casing nozzle with oil or butter as a dry nozzle will cause the casing to constantly tear and will really hamper your progress. 6. Pump the mince through the casing and allow the filled sausage to form a big coil. Try to avoid over stuffing the casings as this may cause them to burst during cooking, however, ensure that the casing is packed tight enough so that no air bubbles can form as this can lead to bacteria growth which can spoil the meat. 7. Once the casing has been stuffed full of all of the mixture you can tie off the other end. When dividing the sausage, merely cut off the desired amount but leave it in a coil (i.e. do not twist into individual links), as Boerewors is traditionally sold as a long coil and not as smaller individual sausages. The final step is to cook the Boerewors (although it is best to leave it in the fridge overnight to allow the flavours to develop). Some people skewer the coil of Boerewors through the side so that it is easier to flip on the BBQ but in our view this is sacrilege and attempts should be made to flip in its natural form. Be careful not to overcook as the best Boerewors is a juicy succulent one. When we ate our Boerewors we were pleasantly surprised by the success on our first go. It was beautifully juicy, had a really strong meatiness to it that no typical butcher shop sausage comes close to. The meat was quite grainy and had a lovely texture and the spice flavouring was absolutely spot on, although for the next batch we make we may increase the levels of the spice mixture to give it a bit of extra punch. Our first bacon experiment also yielded some interesting discoveries. The flavour of the batch certainly wasn't perfect and it was very salty when compared to store bought bacon. So we were keen to fix up the salt quantities in our second batch. 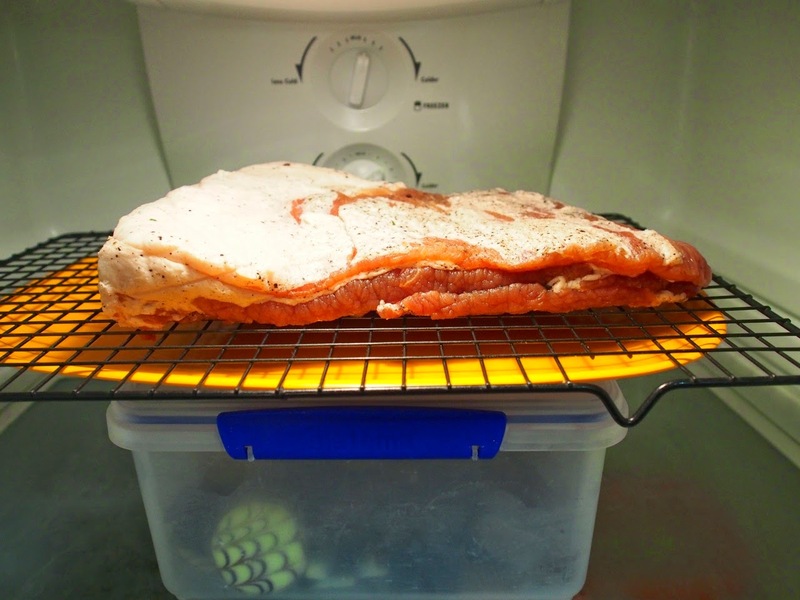 We also found that drying out the bacon, uncovered in a fridge yielded better results than letting it sit in a plastic bag, as was mentioned in Tim Hayward's book Food DIY (but this would still be a good approach if you don't have space in your fridge). 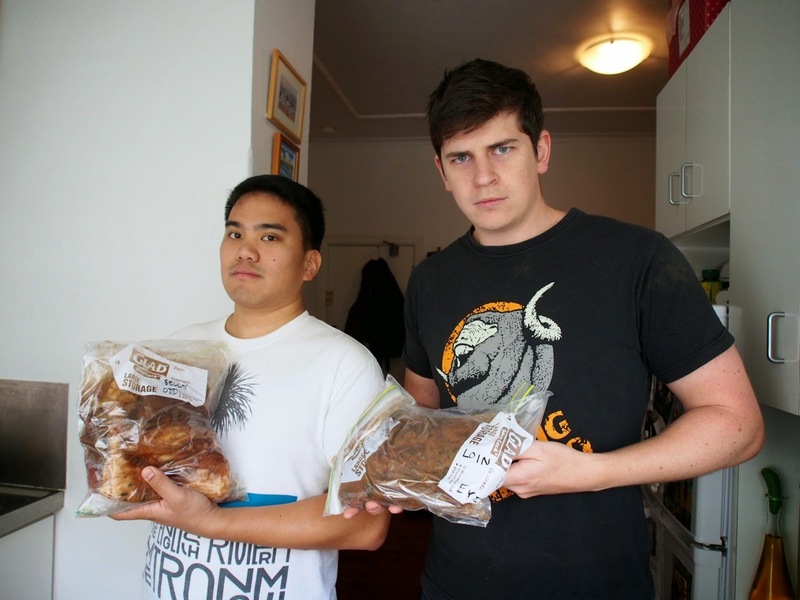 Our first attempt at bacon was delicious but (if we’re being honest) extremely salty. The recipes that we had looked at in our research seemed to ask for about 500g of salt per kilo and we were precise in our measurements. So why did the bacon end up retaining so much salt? Was it the type or brand of salt? We used Saxa brand rock sea salt, which we ground up using a spice grinder. It isn’t the most expensive brand of salt, but would pricier and better quality salt yield different results? 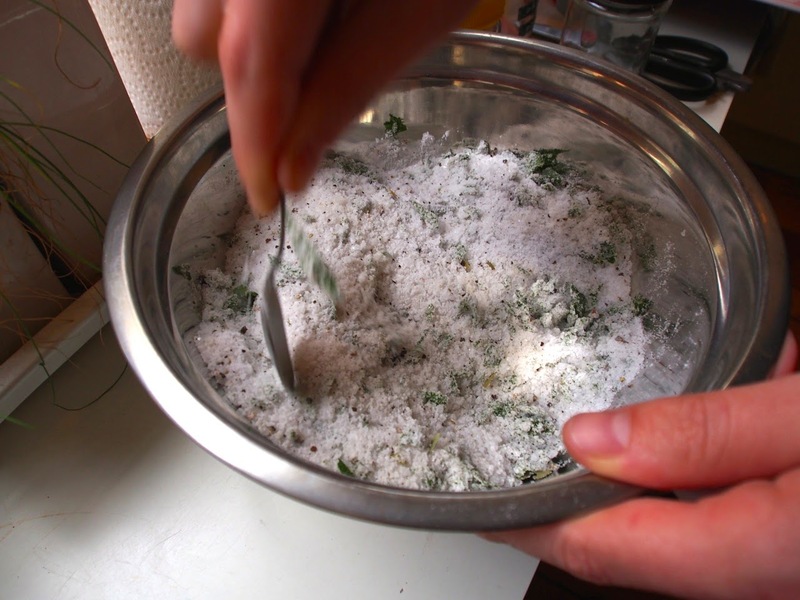 A lot of the recipes online ask for kosher salt, which is apparently less intense than regular sea salt, and comes in flakes rather than rocks (a bit like Maldon sea salt). Unfortunately kosher salt isn’t easy to find in Australia. Or the coarseness of the grind? Does salt penetrate the meat to a larger extent if the salt is finely ground? It certainly dissolves into a brine quicker, so perhaps this means that the brine covers a greater part of the meat. Or simply the quantity? There were a range of recipes online which didn’t ask for as much salt as we had used in our first batch. 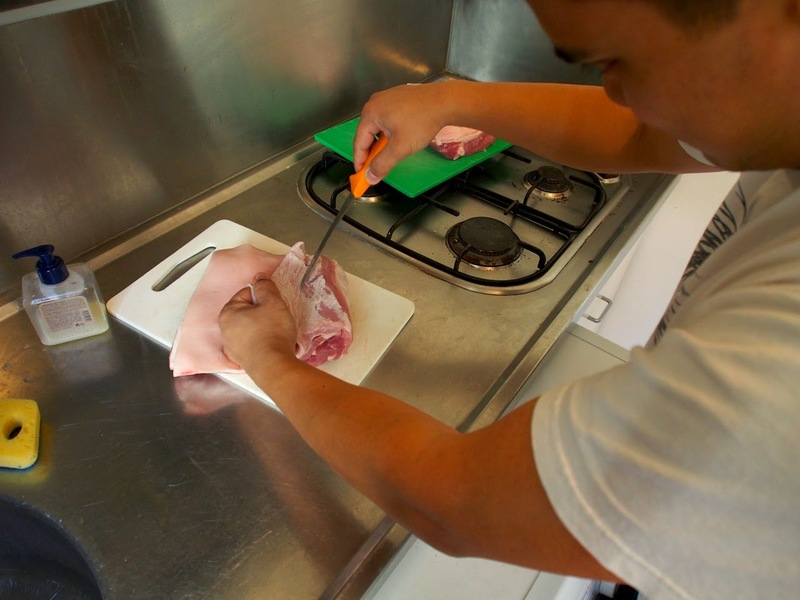 In our first batch we had used 500g per 1kg of meat and as we made 1.5kg of meat this equated to 750 grams. We decided that this may have been excessive, so moving forward we decided to reduce the salt by about a third. So we decided to use 500g of salt regardless of the meat quantities. 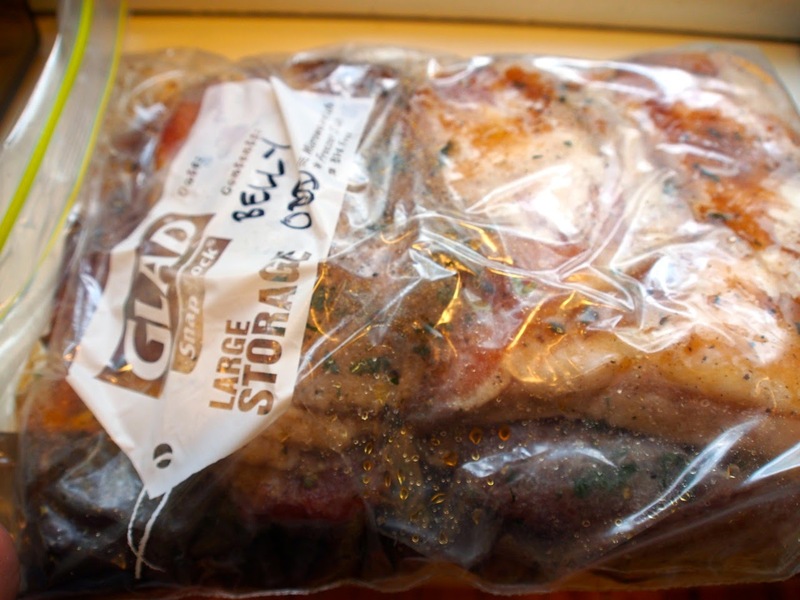 In the end, we had 2kg of pork loin and 2kg of pork belly, and in each bag we included 500g of salt. 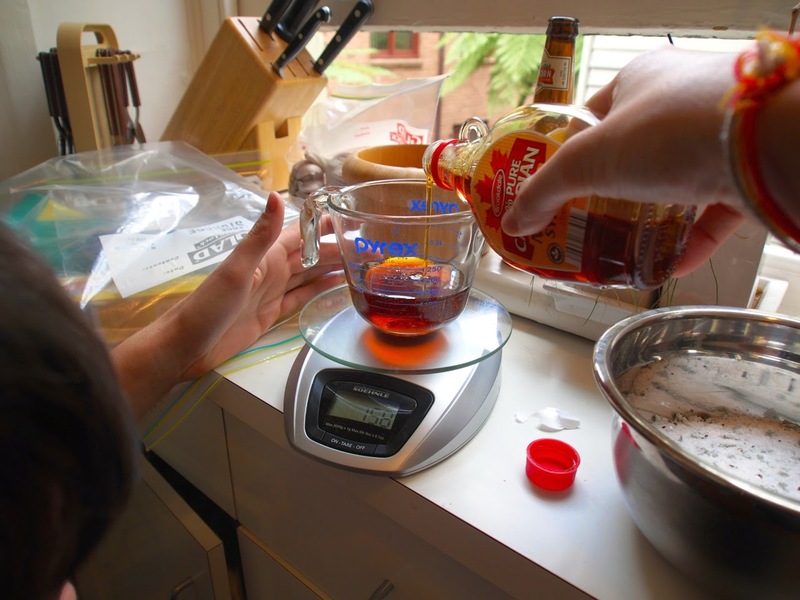 For our first batch, we used sage, juniper, maple syrup and brown sugar as the main flavourings. This time we thought that we would try using honey instead. I had an old jar of honey that needed to be used as it was starting to crystalise in its jar (I heated the honey briefly in the microwave so it would be pourable). To this we added some cinnamon, nutmeg, pepper, thyme and rosemary and chilli flakes. 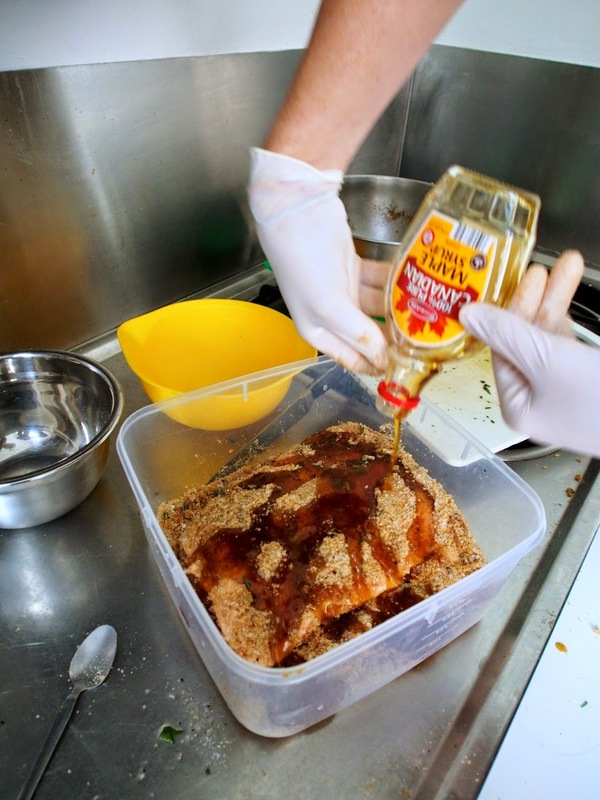 The honey was much thicker than the maple syrup and left a thick coating on the pork. While this second batch of bacon turned out to be less salty than our first, we are still yet to determine the perfect level of salt. We are planning on halving the salt levels for our next batch, or experimenting with another type of salt. The honey imparted some interesting flavours into the bacon. It was slightly more sweet than the first batch and appeared to caramelise more readily than the maple syrup. However, a consequence of this was that the bacon tended to char easily if not cooked with care. The most noticeable flavour we added was the cinnamon. When cooking the bacon, the toasted cinnamon makes it smell like cinnamon scrolls! It’s really quite delicious, but probably less versatile to use in things like pasta, particularly with ingredients that don’t quite go with cinnamon. So it's back to the drawing board for us! We'll post about Bacon 3.0 in the coming weeks. Aside from our shared love of the law, the Butchers of Great Thorne are also renowned for our love of bacon! Whether it be fried up with some eggs sunny side up, on a BLT (preferably minus the L and the T), chopped through some pasta or over a Caesar salad, bacon is the holy grail of meats. It comes as no surprise, therefore, that we decided to cure our own bacon as our second outing. The curing of meat is steeped in a rich, salty history but essentially began as a means of preserving meat to help the peasantry survive the tough months of annual famine throughout winter where it was generally difficult to grow crops, and was also a way that sailors could take meat on long journeys across oceans. 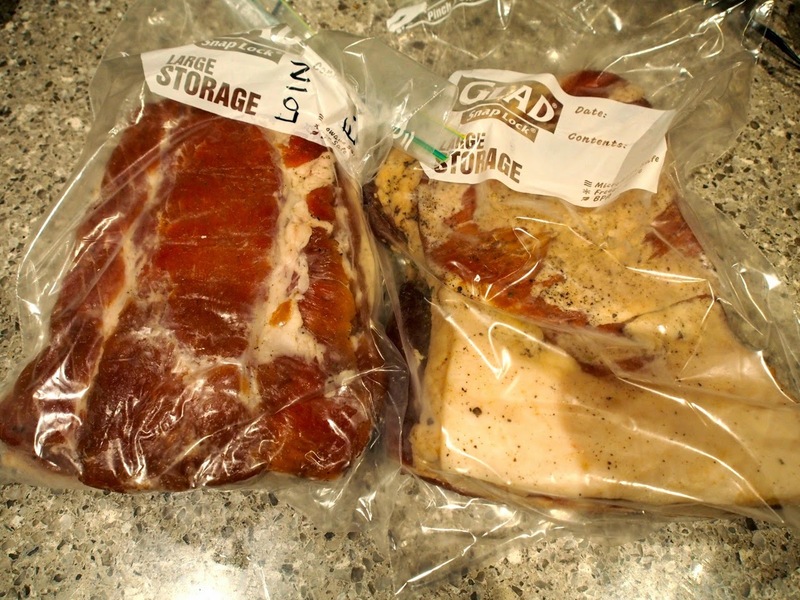 Whilst in the western world it is no longer necessary to preserve meat in this manner due to accessibility of refrigeration, over time this practical and necessary process has developed into a means to add flavour and texture to ordinary pieces of pork (not that pork isn’t delicious as is!). In some circles, curing bacon has become an artisanal pastime with a multitude of delicious and experimental cures being developed and jealously guarded by their creators as the best bacon around. 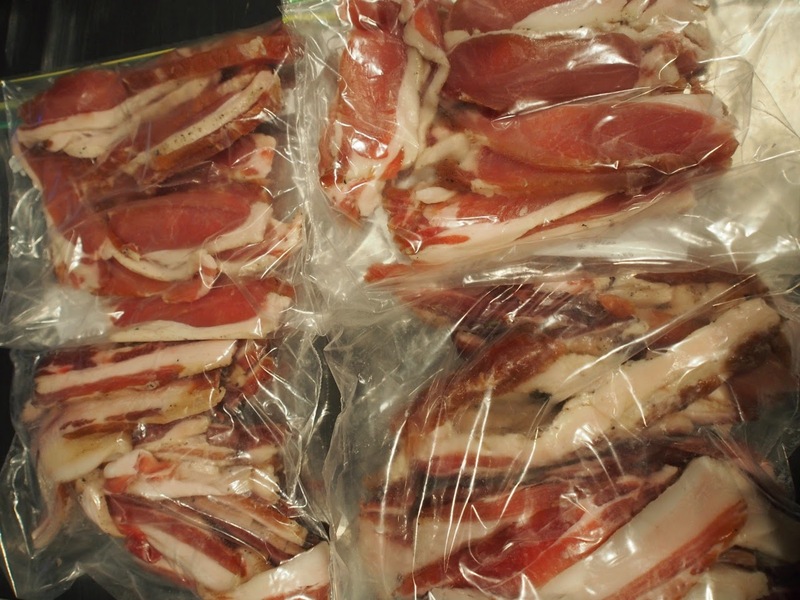 The process of curing bacon basically involves three ingredients. Firstly, salt to draw out moisture from the meat through the process of osmosis, which slows down the ability of microorganisms that are naturally found in all meats to grow. This slows the oxidation process thereby preventing the meat from spoiling and going rancid (yum). Secondly, sugar to alleviate the harsh flavours of the salt, and in the case of bacon, to contribute to flavour. Finally, sodium nitrate (in very small quantities) to help kill bacteria such as Clostridium botulinum, which causes a rare but potentially fatal paralytic illness known as botulism. Sodium nitrate also gives cured bacon its pink colour (bacon cured without sodium nitrate normally is greyish in colour). The use of sodium nitrate is controversial. It is known to create cancer-inducing agents in food, and most people would prefer to remove all traces of carcinogenic chemicals from their diet. However, when weighed against the possibility of poisoning our friends and family, and coupled with the fact that commercial brands are yet to discover a reasonable alternative, we have decided to use sodium nitrate this time. 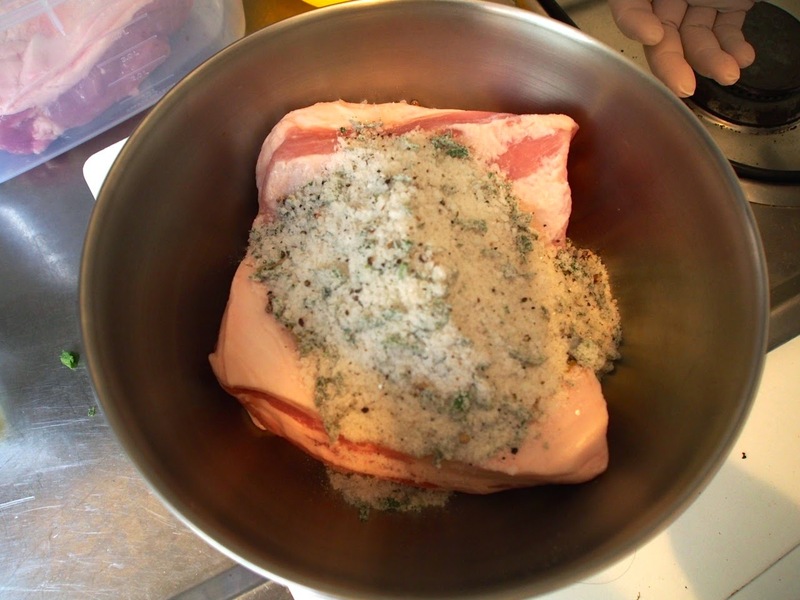 Of course, other spices can be added to the cure to impart flavour, however, the above 3 ingredients will be sufficient to cure your very own bacon. Many recipes include an ingredient called saltpetre (potassium nitrate) which performs the same role as sodium nitrate. As saltpetre is particularly strong, we read that 'Prague Powder' is a safer way of incorporating sodium nitrate. It is essentially sodium nitrate mixed in with normal table salt. It is much easier to control the amount of sodium nitrate you include in your curing mixture by using Prague Powder. We purchased some from this handy online store. Prague Powder number 1 is the type applicable to curing bacon. Prague Powder number 2 is used in air dried salamis and other charcuterie. 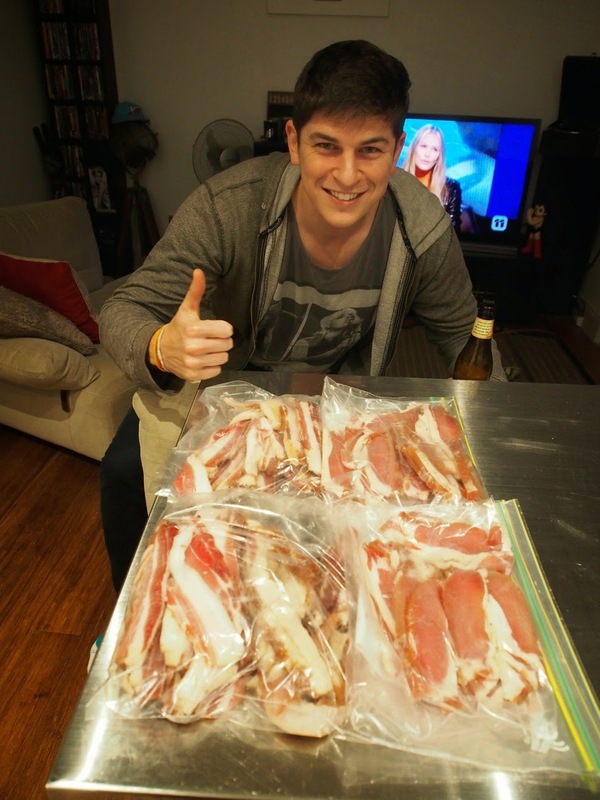 There are 3 methods of curing bacon. 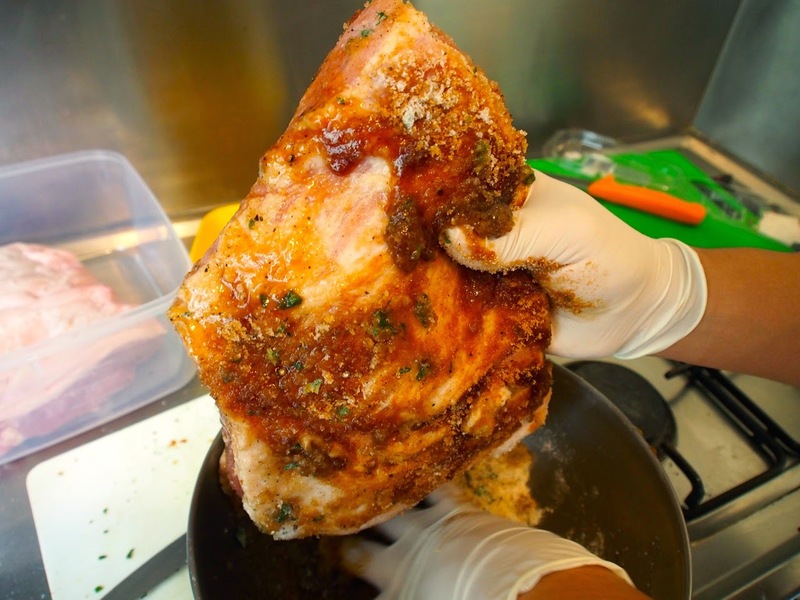 The first involves a dry cure whereby the pork is put in a container with a dry mixture of the above ingredients and any other spices or flavourings, which drains moisture away from the meat. 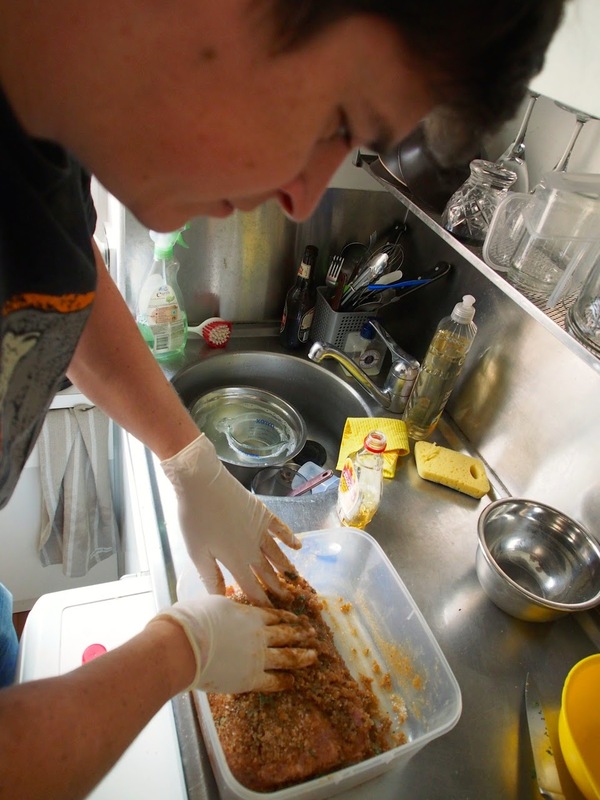 The second method is a wet cure which involves dissolving the curing mixture in water to create a brine and then completely immersing the pork in the solution. 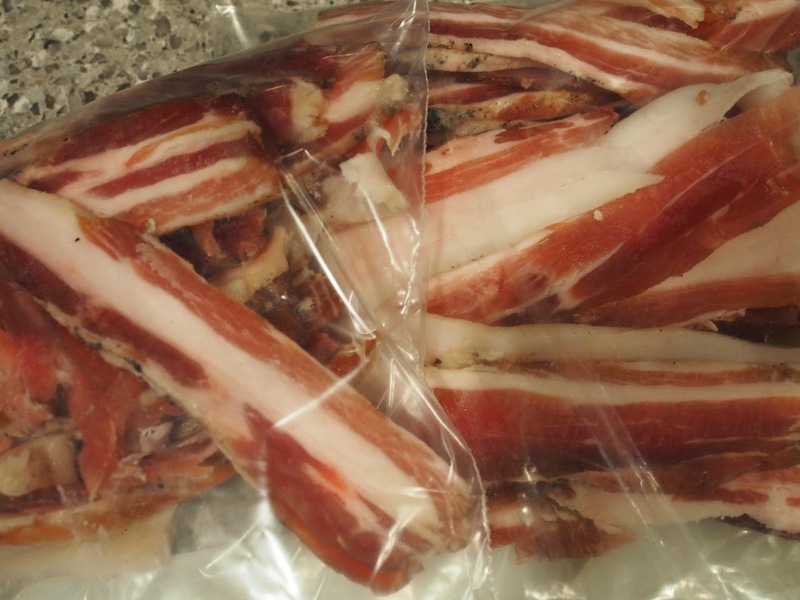 The final method is a mixture of the previous two methods and involves creating a dry curing mixture and then putting the pork and dry cure into a zip lock bag and sitting it in the fridge for 1 week turning the bag over once a day. 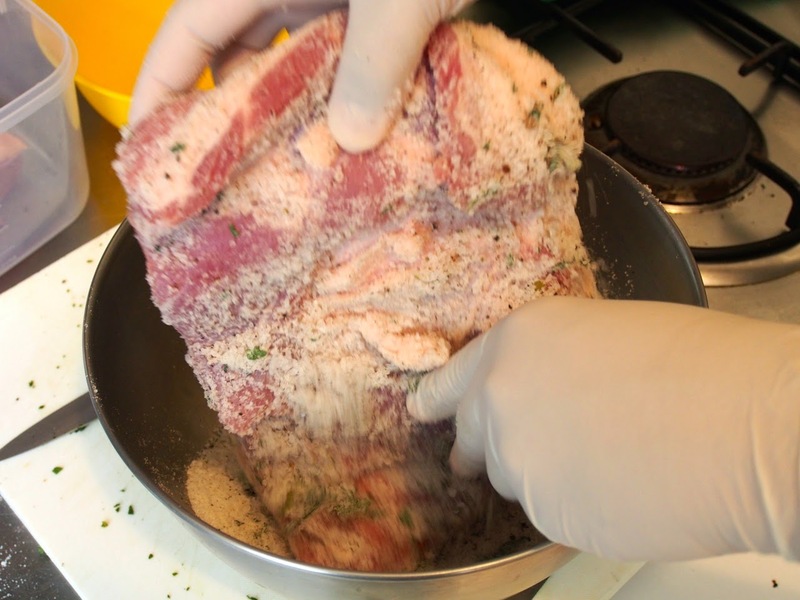 Initially this method acts as a dry cure but as moisture is removed from the meat, it mixes with the curing mixture, ultimately creating a brine solution so that by the end of the cure the bacon will be a semi-wet cure. 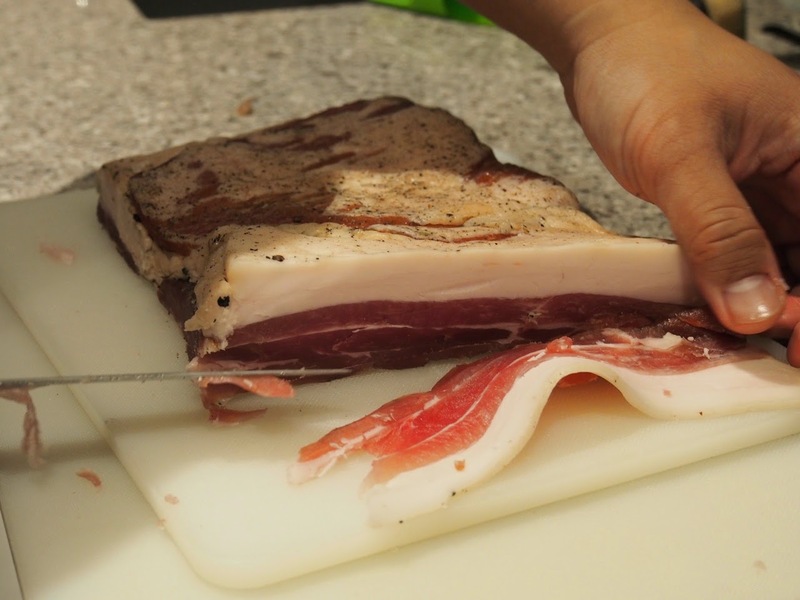 This method is far easier for those who do not have the space for a dry cure and leads to a more traditional dry bacon than a wet cure does. Now for the meat! 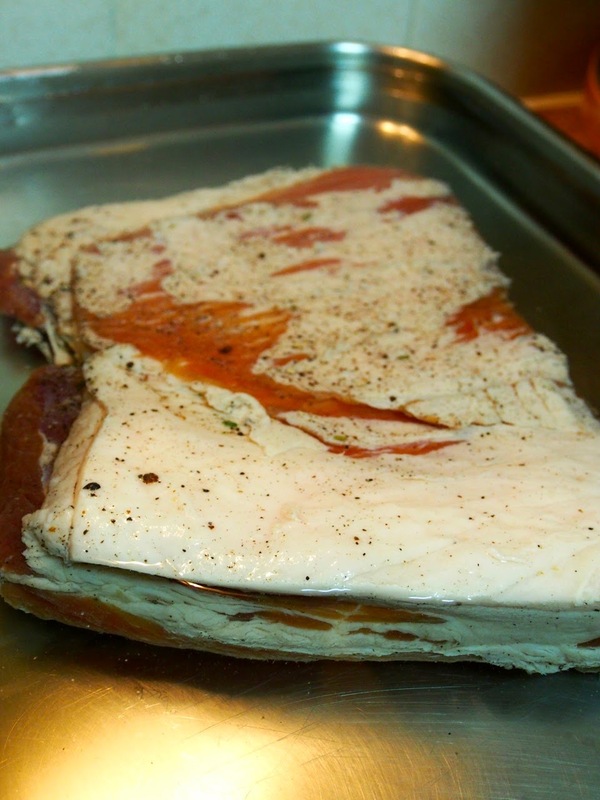 Traditionally in Australia, middle bacon is made up of the loin and pork belly. 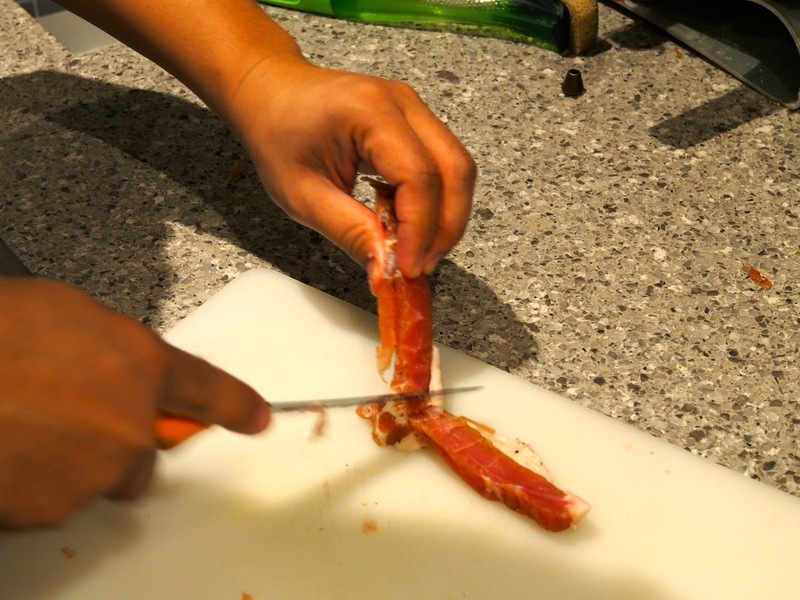 This gives those long pieces of bacon that have a large head with little fat at one end (the loin) with a long streaky and fatty tail of bacon on the other end (pork belly). 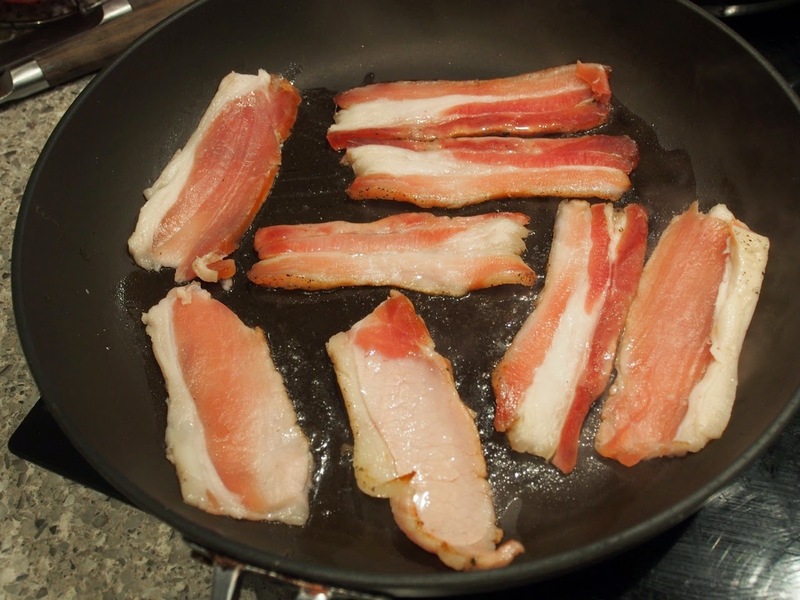 Americans typically only use streaky bacon sourced from the pork belly and call the bacon made from loin “Canadian-style bacon”. We have been unable to verify with a Canadian source whether or not the Canadians are aware of this, or indeed call the pork belly bacon “American-style bacon”. For our first outing we decided to separately cure 1.5kg of pork loin and 1.5kg pork belly to make both styles of bacon. We bought both cuts of meat from the Meat Emporium in Alexandria, but they should be available at most butchers and in many supermarkets. These cuts of meat are quite affordable and shouldn’t blow the budget. There are heaps of recipes out there so it is a matter of finding one that suits your tastes and slowly playing with the ingredients to tweak the bacon to your personal preference. The main recipe we used for inspiration came from Tim Hayward’s book, Food DIY, which includes many excellent curing recipes. Hayward also did a whole radio show about British charcuterie, in which explains how to make bacon at home. 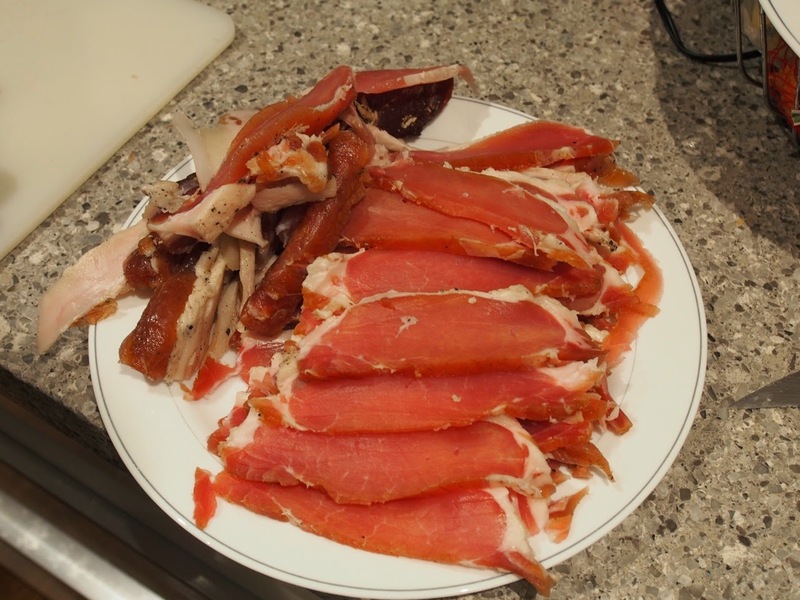 There is also a great article from the Sydney Morning Herald by Keith Austin about homemade bacon. To create the dry cure we ground up the various dry ingredients in a spice grinder and weighed them on an electric cooking scale. Having an electric scale is very important particularly for the Prague Powder which should carefully be measured (too much could be harmful). 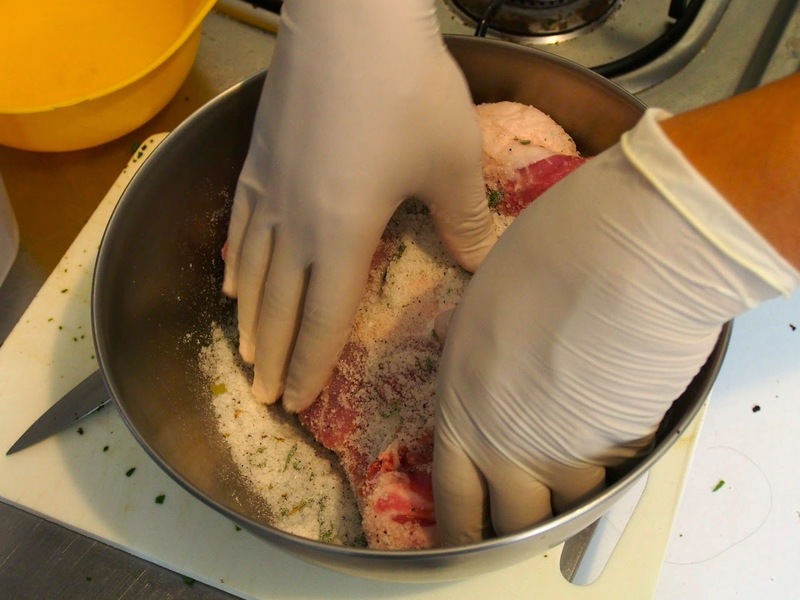 Once we mixed the cure, the next step was to prepare the pork. Both cuts of meat still had the skin or rind attached. 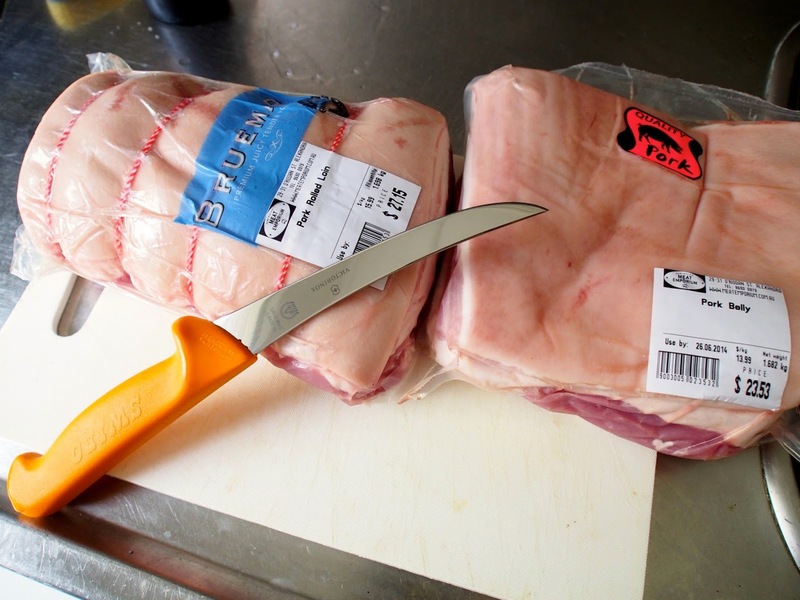 If you buy the meat from a butcher, you can simply ask your butcher to cut off the skin (which you can keep to make pork crackling), however, it is also quite simple to cut the skin of yourself, which is what we did. Using a very sharp knife (we bought a Victorinox butchers knife for $25 which was incredibly/dangerously sharp) cut into the fat at the corner of the meat in an upwards direction towards the skin, but don’t cut the skin off. 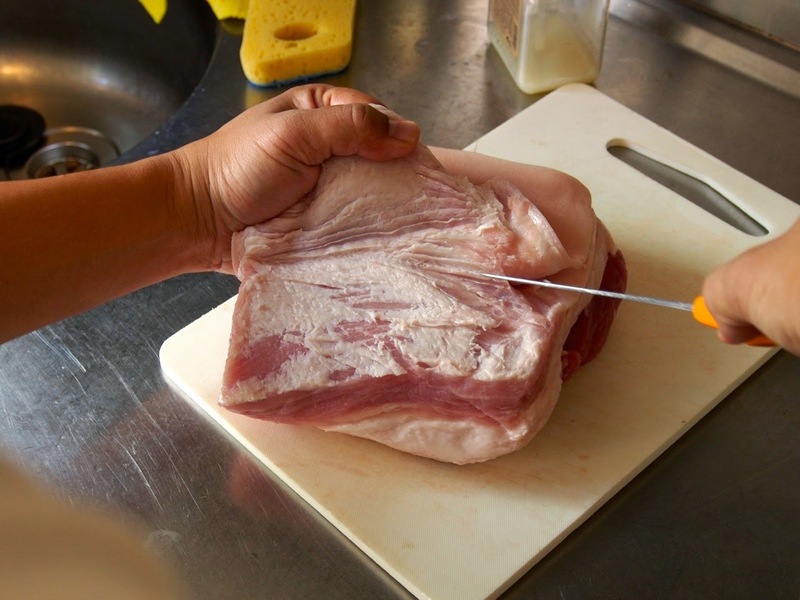 Once you reach the skin grab hold of the little corner of skin, and in soft slicing motions gently cut into the fat right beneath where it connects to the skin whilst pulling at the skin to create tension (see photo above). Once we got the hang of it, removing the skin was a quick and easy task. Have a look at the plethora of YouTube videos for some convenient visual demonstrations. 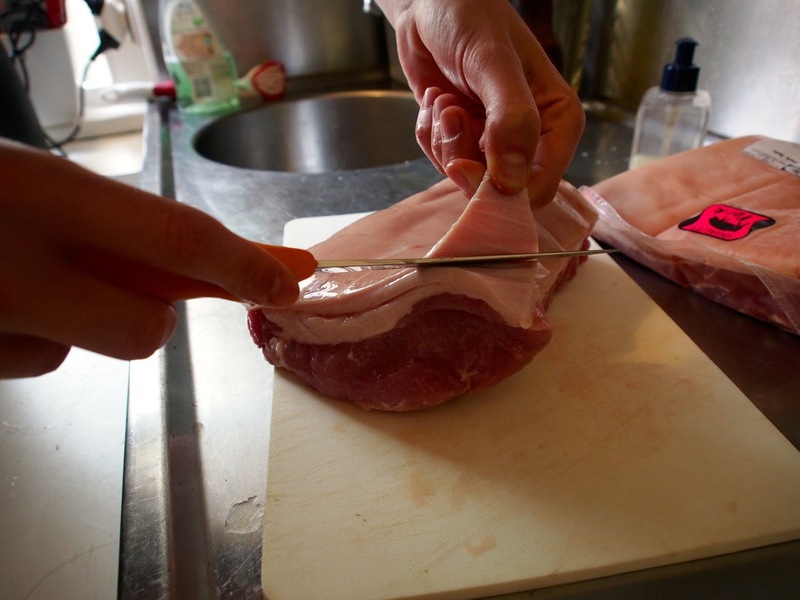 Be careful not to cut off too much fat during the skinning process as you want to keep as much of it on the meat for flavouring when you ultimately fry up that bacon. With the pork and cure prepared, all that was left to do was to combine the two. We massaged the pork with the cure for a couple of minutes to really coat all of its nooks and crannies. 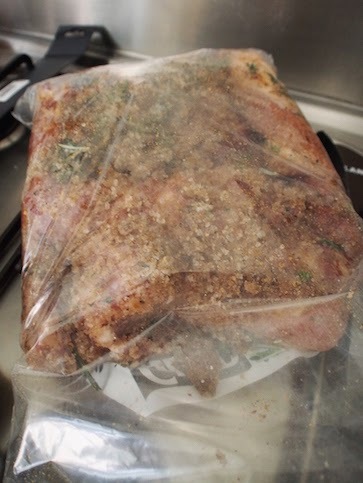 Then we put the pieces of meat with all of the curing mixture in separate store bought ziplock bags, being careful to expel as much air as possible from the bag and ensuring it was air tight. We then put the bacon in our respective fridges for a week, turning it over once a day to ensure that both sides of the meat were equally exposed to the cure. 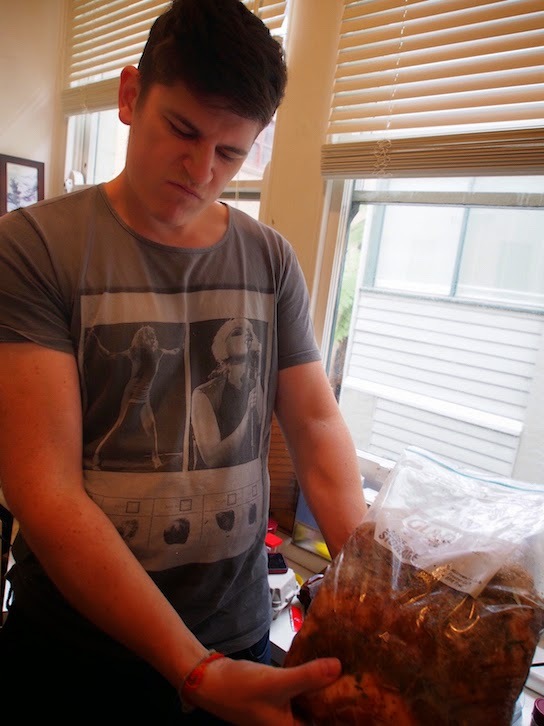 You also need to regularly massage the meat in its bag throughout the week to make sure the cure dissolves and really coats all parts the meat. After the first couple of days we could see the moisture being drawn out of the pork and mixing with the dry cure, gradually turning the dry cure into a brine. 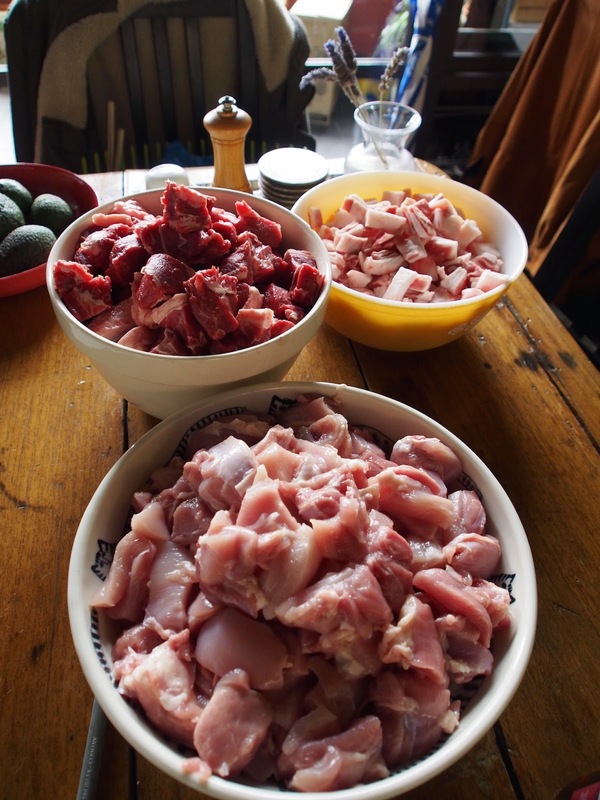 The colour of the pork slowly changed from a greyish pink to a deep red, and the meat began to condense and become quite compact (as a result of the moisture being drawn out). On the 7th day we pulled the pork out of the ziplock bag, washed off the excess cure in fresh water and soaked the pork for an hour in fresh water to further expel any excess salt. 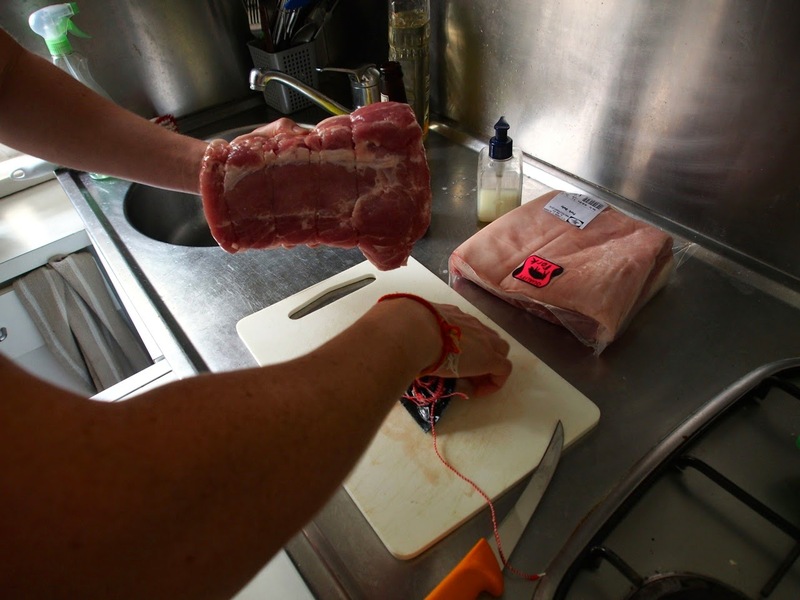 We then rested the pork for a further 2 days before trying it. The pork loin we rested in a fresh ziplock bag in the fridge, whereas the pork belly was dried out on a wire rack in Vinnie’s parent’s fridge (they were overseas at the time and actually had a spare empty fridge… as you do) We did this to compare how the drying methods differed and found that whilst the pork belly was a little more dry as a result, this did not ultimately result in a significant improvement to the flavour of the belly over the loin. 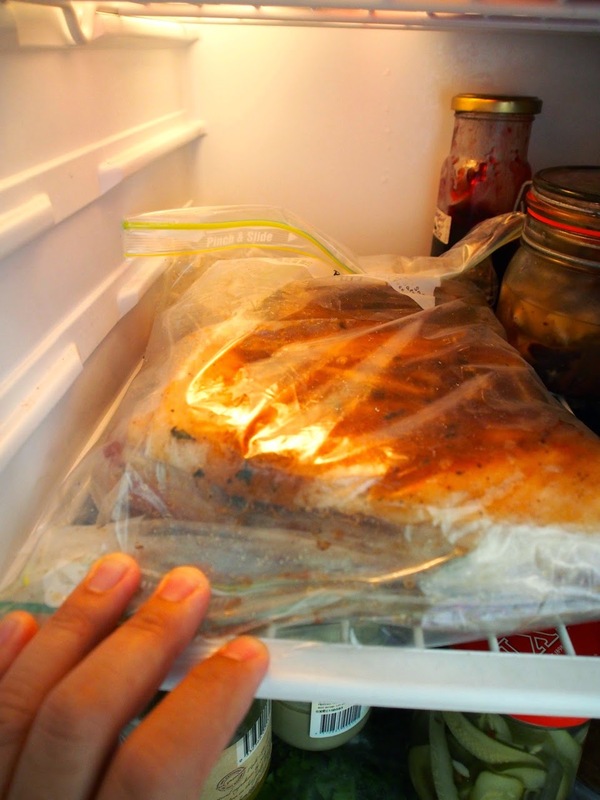 The take away message is that if you don’t have a spare empty fridge or a dark dry garage to hang the bacon for a couple of days then drying it in the fridge in a ziplock bag is a simple option to achieve a very similar result. 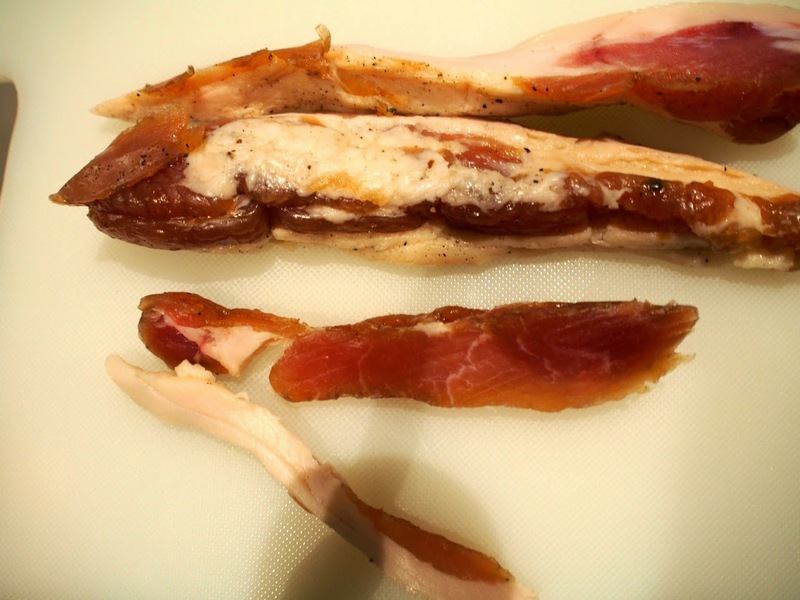 Many bacon curing recipes also want you to smoke the bacon. But contrary to popular belief, this is not strictly part of curing the bacon and isn’t an essential step in the process. Smoking simply cooks and flavours the bacon. For our first couple of outings we want to really nail the curing process and when we are confident that we have the perfect curing mixture, and have manage to find the apparatus and space required for smoking, we will begin to tinker with smoking. Once the bacon had dried, we trimmed the edges (these offcuts could be used to flavour stock, or in some homemade baked beans!) to create a uniform shape and began slicing. 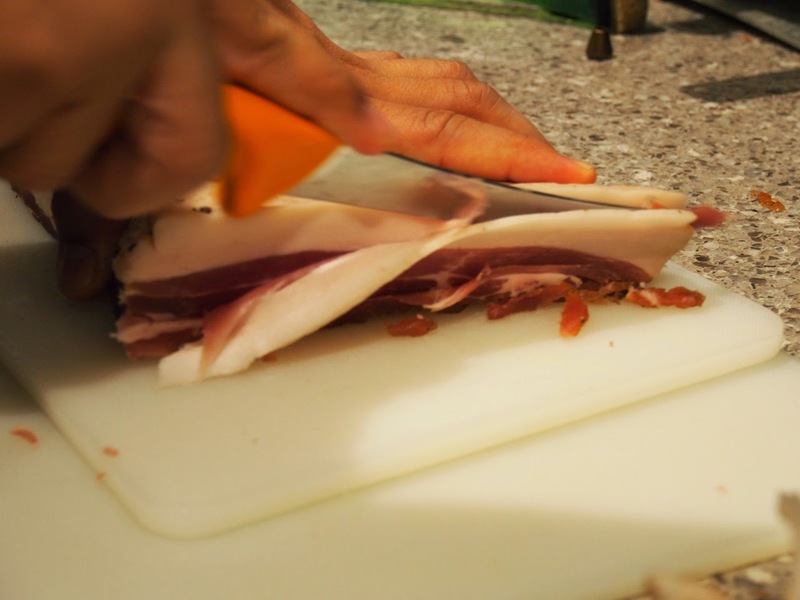 You need a really sharp knife to cut through the bacon and to ensure you have even slices. Alternatively if you have the money and space in your kitchen, a deli slicer would make quick work of it (ALDI was selling a deli slicer for around $60 recently…). We ended up having just over a dozen slices of pork belly and loin each. And finally the important part, the taste testing! 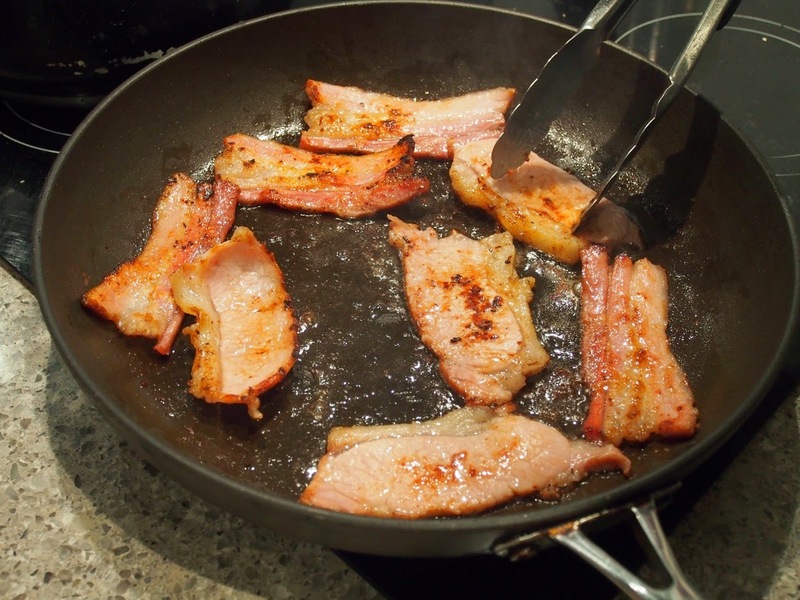 The first thing we noticed when cooking the bacon is that when we put it on a hot frying pan there was no white liquid oozing from the meat, which is not uncommon when cooking store-bought bacon. This is because store-bought bacon is usually produced en masse using a brining process where brine is injected directly into the pork to speed up the curing process. In our opinion, our homemade bacon crisped up much better than store bought bacon. The second thing we noticed is the caramelisation of the bacon and the fat. Visually this made the bacon look even more delicious and is likely a result of the brown sugar and maple syrup in the cure. When it came to taste testing, the flavour and texture of the bacon was really something else compared to store bought bacon. It was quite dense (as a result of the lack of moisture) and had a really meaty flavour. The bacon was initially quite salty in flavour which we have subsequently learned is not an uncommon reaction for people having only ever eaten store bought bacon. After the initial shock, we both felt that the salty flavour was really quite delicious, and the sugar and maple flavours cut through the saltiness. If you are concerned about the salt levels, it is possible to soak the bacon in fresh water for longer after you have rinsed off the cure (as mentioned above we only did this for an hour), as this will draw out more of the salt from the meat. Some recipes suggest soaking it for up to a day. Alternatively, you can tinker with the salt levels on your next bacon venture, which we plan to do. 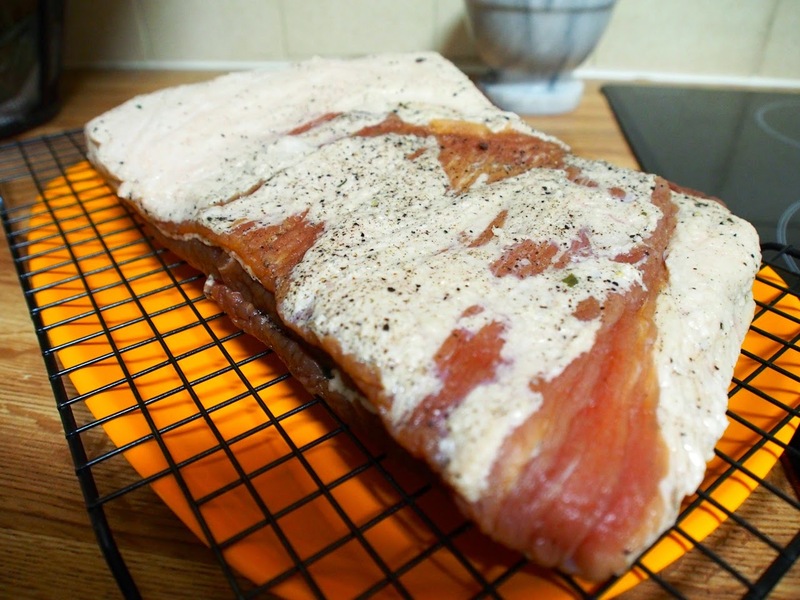 Overall, curing the bacon was a surprisingly simple process, with very satisfactory results. We strongly recommend that people give it a go and let us know how it works out for you. Stay tuned for our next bacon venture where we plan on experimenting with a spicy cure with lots of punchy cayenne and chilli! But first, we will tackle our next batch of sausages where we will attempt to make the perfect boerewors.